That’s because it is an outcrossing, wind-pollinated crop. Each corn plant has both male and female flowers; the pollen-producing tassels at the top of the plant are the male flowers, while each ear is an inflorescence of female flowers, producing pollen-collecting silks. As the tassels shed pollen, wind carries these tiny grains to silks that have emerged from the immature ears. Each individual silk that gets pollinated results in a kernel of corn on the cob. Because corn relies on wind to carry pollen from the tassels to the silks, the light pollen grains may travel a few miles before finding and pollinating a silk. Your neighbor’s corn can therefore very easily pollinate yours, making it tricky to save pure seed from your open-pollinated corn. During the 2013 growing season at Heritage Farm, the Preservation garden crew grew out 18 varieties of open-pollinated corn from our seed vault to replenish the supply in our collection, increase the viability of the seed, and evaluate varietal characteristics. Preventing cross-pollination between these varieties can be difficult, especially considering that Heritage Farm is located in Northeast Iowa, a region known to farm almost exclusively genetically modified (GMO) feed corn and soybeans. Cross pollination with GMO corn is of particular concern for preserving historic varieties because GMO corn contains genes not historically found in the corn genome. There are a few ways to prevent cross-pollination among corn varieties, the most basic of which is to grow only one variety each year. But if you have an appetite for diversity, there are options. One method involves utilizing timing and can be done by simply growing two varieties that vary dramatically in days-to-maturity. For example, a 100-110 day corn variety such as Bloody Butcher can be grown next to a 70-80 day corn such as Blue Jade. This method is risky, though, and also does not account for what your neighbor is growing. Alternatively, the technique that allows for the most control over seed purity is hand-pollination; most corn grown at Heritage Farm is hand-pollinated. This involves putting bags over the ears before the silks emerge to prevent any pollen from finding them. 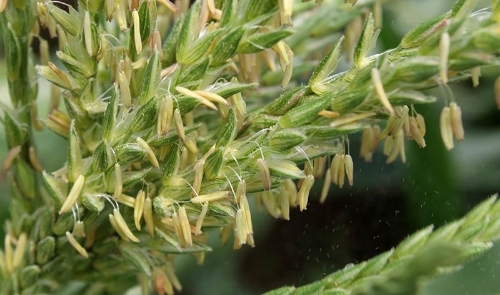 Pollen is collected by tightly bagging the tassels and then used to hand-pollinate the silks on each ear. More details about this process can be found in our webinars and in the book Seed to Seed. One final, obvious method for preventing cross-pollination is by simply utilizing distance and natural barriers. Historically, isolation distance has been the primary method used to maintain varietal purity in corn. In his book, Corn Among the Indians of the Upper Missouri, published in 1917, George Will describes 14 distinct corn varieties maintained by the Mandan Nation of North Dakota. He writes that the Mandans maintained purity by growing each variety “a couple hundred yards” apart, and by careful ear selection for their seed corn. Two hundred yards is 600 feet—more recent agricultural research confirms that at this distance, cross-pollination is generally 1% or less. Yet studies also show that at distances up to 1640 feet, it was not possible to limit cross-pollination to below 0.1% (http://ohioline.osu.edu/agf-fact/0153.html). 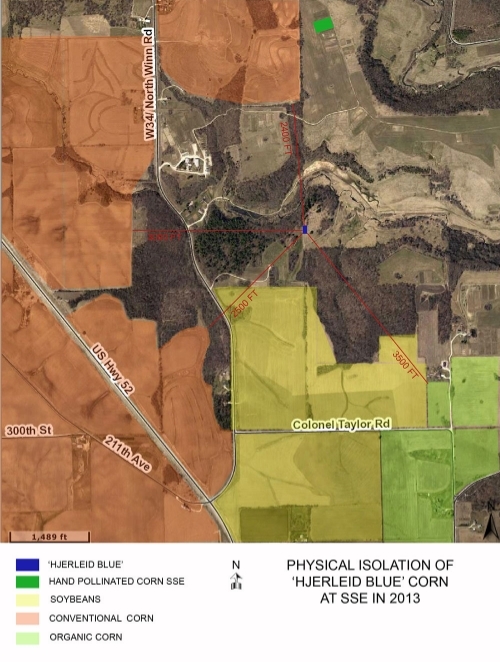 The 890 acres of Heritage Farm contain many natural barriers for pollen dispersal, such as forested areas and rugged limestone bluffs. This year we wanted to grow a larger-than-usual planting of ‘Hjerleid Blue’ corn (pronounced "zhair lide" blue), an heirloom blue sweet corn grown by the Hjerleid family of Wisconsin since at least the 1940s. As hand-pollination of such a large planting would be especially labor-intensive, we grew this variety in a garden that we thought would be isolated enough to prevent cross-pollination from neighboring fields of conventional corn, which is likely GMO. This garden, east of our historic orchard, was at least 2300 feet (half a mile) from any corn field and was buffered by woods and elevation changes. A blue sweet corn such as ‘Hjerleid Blue’ is genetically recessive to GMO field corn in two visible kernel traits—a wrinkled sweet kernel and a white endosperm. GMO field corn exhibits the dominant traits of a smooth kernel and a yellow endosperm. Therefore, a kernel of ‘Hjerleid Blue’ pollinated by GMO pollen would be non-wrinkled and have a yellow endosperm —it would easily stand out amongst its peers. We thought that growing ‘Hjerleid Blue’ in our isolated, buffered garden would be sufficient to prevent any cross-pollination with neighboring GMO corn. We were wrong. From a population of over 200 plants, we found a few scattered off-type kernels on six different ears. This genetic contamination represents less than 0.1% of the population in this generation, but if those off-type kernels were planted in the next generation, those plants, with 50% GMO genetics, would introduce a far greater level of GMO contamination to the population. For the purposes of non-GMO food labeling, the level of contamination we experienced is acceptable. But for the purposes of saving seed, any GMO contamination is unacceptable because the contamination will increase exponentially in each successive generation. Had we grown an historic yellow dent corn in that orchard garden, we never would have known that we had introduced GMO genes into the population because it would not have been visually apparent. 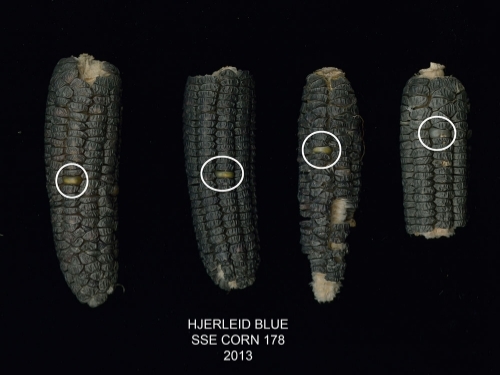 For the ‘Hjerleid Blue’, we were able to carefully inspect every ear and remove the few GMO-pollinated kernels. The main lesson here is that if you are saving corn seed in the corn belt, it is extremely difficult to prevent GMO cross-pollination without doing hand-pollination. The Midwestern summer air is awash with GMO pollen. 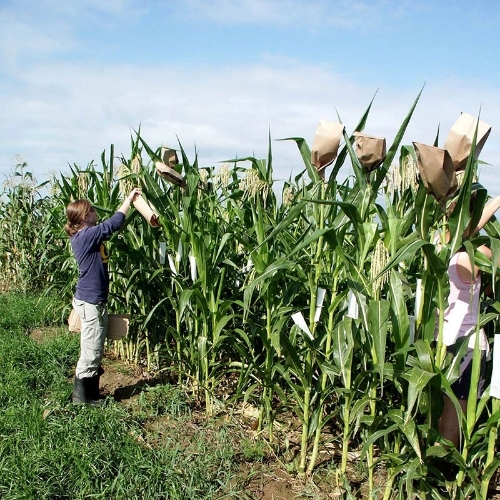 Corn-belt seed savers who want to ensure they eliminate all GMO contamination may want to learn to hand-pollinate their corn, or grow varieties where GMO contamination is visually apparent, such as white or blue corn. Seed Savers Exchange is offering the 'Hjerleid Blue' sweet corn in the 2014 Seed Exchange. Become a Seed Savers Exchange member to get access to this variety as well as thousands of other rare heirloom and open-pollinated seeds.